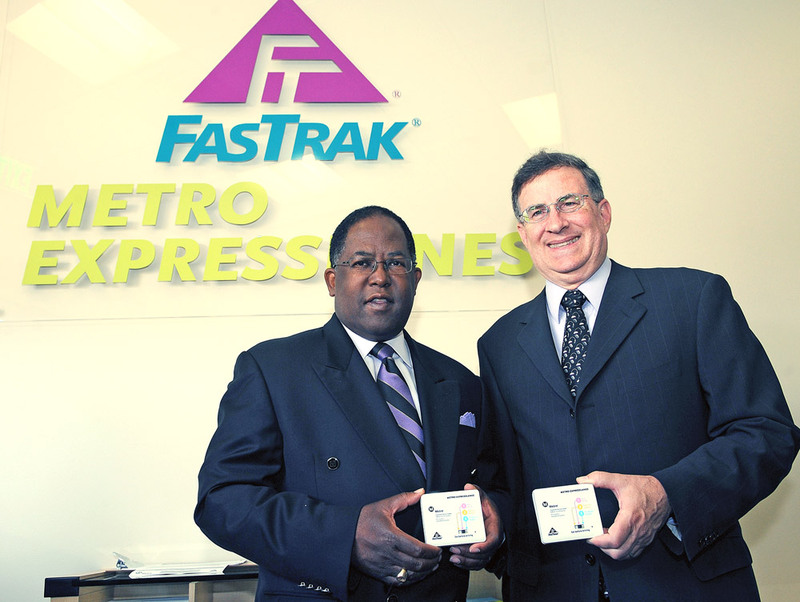 LA County Supervisor and Metro Board Member Mark Ridley-Thomas and Metro Board member/Duarte Mayor John Fasana with their transponders. Photos by Juan Ocampo. Metro and Caltrans offcials who today announced the opening of the Metro ExpressLanes Customer Walk-in Center in Gardena where the public can open a FasTrak® account and receive a FasTrak® transponder to enable them to enter the Metro ExpressLanes. Mark Ridley-Thomas, LA County Supervisor and Metro Board member, leads the ribbon-cutting ceremony July 25 to open the Metro ExpressLanes Customer Service Center. Included among the officials are John Fasana, Duarte Mayor & Metro Board member; Pam O’Connor, Santa Monica City Councilmember, Metro Board member & SCAG Board member; Michael Miles, Caltrans District 7 Executive Director; Art Leahy, Metro CEO; Stephanie Wiggins, Metro EO, Congestion Reduction Initiative Program; Kathleen Daly, Program Manger, AAA Discounts; Jim Thomas, Thomas Properties Group and former Metro Director and Los Angeles County Supervisor Yvonne Burke. I don’t think people are interested to go down to Gardena to get the transponders. The operating hours of the walk-in center is not convenient to most people. I recently tried calling the toll free number, could not talk to a person. Same with 511.